Marika Maijala is an independent illustrator and children’s book author living and working in Helsinki, Finland. She has illustrated children’s books for all the main publishers in Finland and books with her illustrations have been published also in the USA, United Kingdom, Japan, Germany, France, China, Estonia, Sweden, Denmark, India and Abu Dhabi. She has been awarded the Rudolf Koivu prize for the best Finnish children’s book illustration and she has been nominated twice for the prestigious Finlandia Junior prize as well as the Astrid Lindgren Memorial Award. Her debut picture book as a children’s book author, Ruusun matka, came out in October 2018. Illustrations from Ruusun matka have been selected in The Bologna Illustrators Exhibition 2019. Bringing new life to poster art! 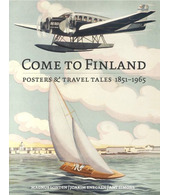 The Finnish illustrator Marika Maijala is a part of Come to Finland’s effort to create a renaissance for the almost forgotten genre of poster art.